The Opioid Epidemic	A Trend CT feature. 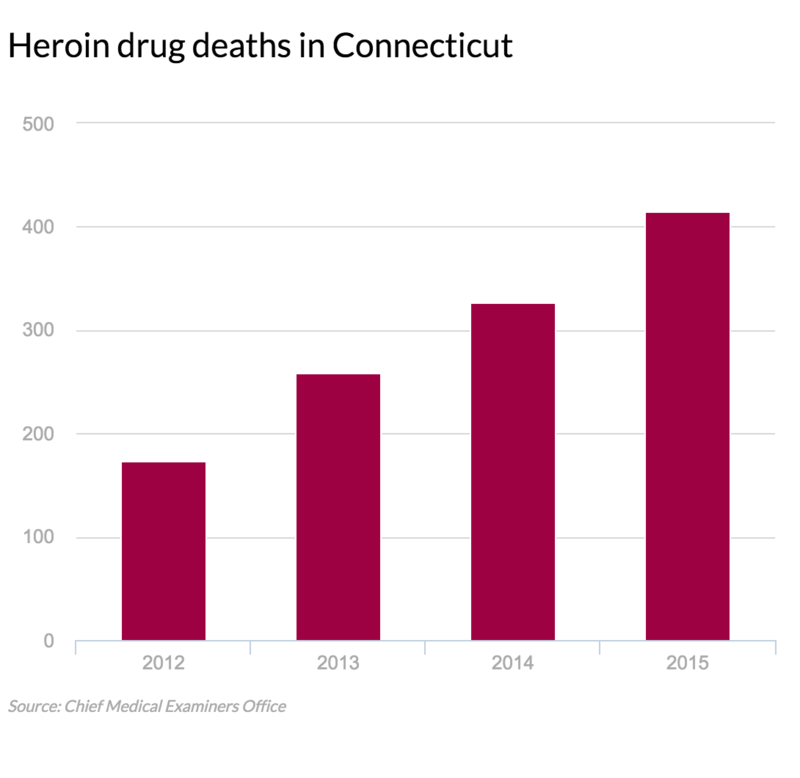 In a series of stories all this week, Trend CT uses data to better understand the state's intractable drug-overdose problem. Who is dying in Connecticut’s opioid overdose crisis? On average, two people die of a drug overdose every day in Connecticut. More people die here from overdoses than in car accidents or by gunshot. There were about 2,000 drug overdose deaths in Connecticut between 2012 and 2015. The 723 deaths last year were more than twice the number three years ago. Most often, Connecticut’s overdose deaths took place in homes— sometimes those of the victim’s mother or sister. But the dead have been found in a variety of other places, too: beneath an I-91 overpass, for example; a motel room, or a parking lot behind a pet store. Lawmakers have passed bills in response to the crisis, among them measures to create a prescription database, to provide more training for health and public safety officials, and to provide better access to anti-overdose drugs. And yet the number of drug-related deaths continues to climb. Opioid drugs are crucial for the treatment of pain and illness, but have the potential to lead to dependence, abuse, addiction, and then overdose. Who suffers most? Which communities? Why isn’t the epidemic slowing and what can be done about it? Trend CT seeks to address these questions with data in a series of stories each day this week. From 2000 to 2014 nearly half a million persons in the United States died from drug overdoses, according to the Centers for Disease Control and Prevention. During that period, the age-adjusted drug overdose death rate has more than doubled from 6.2 per 100,000 persons in 2000 to 14.7 per 100,000 in 2014. Connecticut has surpassed the national death rate for drug and opioid overdoses since 2013. In 2014, the five states with the highest rates of drug overdose deaths were West Virginia (35.5 deaths per 100,000), New Mexico (27.3), New Hampshire (26.2), Kentucky (24.7) and Ohio (24.6). In New England, New Hampshire, Maine, and Massachusetts had the most statistically significant increases in the rate of drug overdose rates between 2013 and 2014. New Hampshire had the second-largest increase in the country. Drug-induced death was the leading cause for injury death among adults in Connecticut. Since 1999, drug-related deaths were similar in number to motor vehicle accidents. There was a spike in 2006 and 2007 but the number fell to a low of 357 deaths in 2010. It has soared, however, in the last five years. Similarly, accidental deaths related to alcohol also saw a sharp increase in 2013 after declining since 2009. According to the data, many of those who died from drug overdoses also had alcohol in their system. More than 100 million people across the country suffering from chronic pain are undertreated by the medical community, according to estimates from the Institute of Medicine. Untreated chronic pain results in hundreds of billions in medical bills and lost productivity. According to Dr. Daniel Tobin, assistant professor of medicine at Yale University, the opioid overdose phenomenon traces back to 2001, when the Joint Commission on Accreditation of Healthcare Organizations began requiring hospitals and health care facilities to ask about pain as the fifth vital sign, along with pulse, blood pressure, oxygen saturation, and temperature. "Pain is a symptom but not an objective vital sign," said Tobin. The level of pain treatment became part of a quality metric for evaluating hospitals, and, as a result, the rate of prescribing painkilling medicine– largely opioids— rose. "I think even though it's a decade later, we're seeing the effects of over-prescribing that started in the early 2000s," Tobin said. Of the 723 overdose deaths in 2015, more than 60 percent involved opioids. Opioids are synthetic drugs manufactured to work similarly to opiates. They include drugs like oxycodone, methadone, hydrocodone, hydromorphine, and fentanyl. "It works for some but not everyone. There's no safe and sustainable way to relieve pain completely," said Tobin. Total pain relief is possible on a temporary basis only. "Tolerance develops, so dosage goes up, and risk goes up." Once the potential for overdose was recognized as a public health problem, slowly more brakes in the form of legislation or new medical standards were applied to the system to monitor and track use of painkillers and discourage doctors from over-subscribing. Almost 80 percent of the prescribers for opioid medicines are primary care doctors and not pain specialists, said Tobin. According to a 2011 study, of 133 medical schools, only five had offered any course of training on how to treat pain. Another 17 offered it as an elective. "There's also this fantasy that patients can be refered to pain specialists," said Tobin "But there's maybe four specialists for every 100,000 in pain." Data shows that people who use opioids non-medically don't typically get them from doctors or prescriptions, rather from a relative's medicine cabinet or a friend. One typical scenario: After a root canal, a patient's dental prescription for Vicoden or Percocet could be for 30 days. But the recovery is likely to take is only a few days, so the leftovers get put away. Doctors cannot assume they can predict who might be predisposed to opioid abuse. The data shows that opoioid overdose deaths affect all demographics. "It's awful to be in chronic pain. We should be careful we don't overreact and make it difficult for people who are suffering to access it," said Tobin. "We should be assuming some risk for everyone and standardizing this approach." A public act in 2013 required prescribers in Connecticut to register with the prescription monitoring program— one that started in 2008. However in 2014, half of the prescribers in Connecticut still had not registered, said officials. Those who did found the system time-consuming and difficult to use. The prescription monitoring program also does not include data from neighboring states. Many patients, especially those who live in towns that border New York, can go back and forth between doctors with neither side sharing the knowledge. Only in the past few years have legislators increased the number of tools for medical emergency workers and expanded the range of those who can prescribe or administer Narcan, the emergency anti-overdose drug. For some time, Connecticut's anti-overdose policies lagged behind those of other states. "I think we're finally catching up with where we should be," said Tobin. Tightening control on prescription pain killer, however, drives some people abusing pills to switch to heroin which is cheaper and far more available. According to the data, heroin use is rising again even as abuse of opioids is leveling off. From 2014 to 2015, the number of times fentanyl was found in the bloodstream of overdose victims increased 150 percent, and last year it was responsible for one quarter of all drug overdoses. Law enforcement officials have recently reported an increased availability of illicitly manufactured fentanyl. Drug dealers cut heroin with fentanyl to increase the potency of the product. The only drug that has declined in use over the years is cocaine alone, though deaths increased slightly between 2014 and 2015. Drug overdose deaths involving heroin continued to climb sharply, with heroin overdoses more than doubling from 2012 to 2015. "It's like a balloon you squeeze on side and it just becomes larger on the other end," said Tobin. Next: Who is most affected?